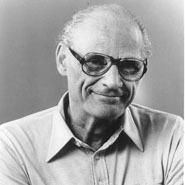 Arthur Miller was deeply affected by his father's ruin in the Depression. At that time, the family moved from Manhattan into a small home in Brooklyn, which became the setting for Miller's most famous play, Death of a Salesman (1949). His play The Crucible premiered in 1953, and although its plot concerned witch-hunts in colonial America, audiences understood the play to be an allegory for the scrutiny of left-leaning Americans by the House Un-American Activities Committee. In 1956-1957, Miller was investigated by the committee, and was found in contempt for refusing to identify writers believed to hold Communist sympathies. One year later, a Washington appeals court cleared him of the conviction. Miller published over thirty plays and has won a Pulitzer Prize and multiple Tony Awards, among other honors.